build – compiles and runs tests. devstage – ftp’s our project to the development test environment. triggered by the build’s success. release to live boxes. This is a manual trigger. Each of these jobs has a hudson build number, however only the “build” job’s build matters, because that references the code built, and includes the source control changeset details, including the commit messages. We also use it to generate part of the version number of our product. When we release to the dev environment and the live environment, we use the build number as the version number. When there’s 7 different build numbers, and if you decide to change the name of one of your jobs, this can become very confusing, very quickly. And hey presto! 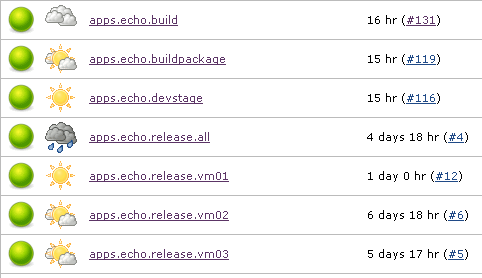 Your release folders are the same number as the build project. No more confusion! Thanks for this. As you said, there is no documentation for this plugin at all so you have really helped me today. Hey! Step 5. Where exactly do you configure this on a job? Do you mean something like ant? If we do not use ant? you can you a build script like batch file, nant, rake… anything really. You can also use the tasks in Jenkins itself. Step Five is purely to show you how to get that build number for use.